The Rapsodie nègre, written in the spring of 1917, is the earliest Poulenc work to have survived. 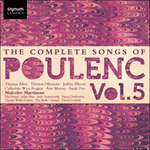 In writing it for voice and instrumental ensemble, Poulenc was very much a child of his time. Even though Schönberg’s Pierrot lunaire was not heard in Paris complete until January 1922, its influence was already felt through the mediation of other works it inspired either directly, such as Stravinsky’s Trois poésies de la lyrique japonaise, or indirectly, such as Ravel’s Trois poèmes de Stéphane Mallarmé. But instrumentation aside, the essential character of Poulenc’s work owes very little to any of those three works, even if odd corners of melody and harmony suggest he had been listening to the Ravel Piano Trio. Overall, it owes more to Picasso’s African enthusiasms and could best be described as ‘neo-brutalist’, beginning with clanging consecutive fifths and embracing crude noises of all kinds, including the nonsense words of ‘Honoloulou’ which were provided by an unknown friend of the composer, decently obscured behind the pseudonym Makoko Kangourou. Ostinatos and sudden surprises abound, and Poulenc’s characteristic final, joky signatures are already in evidence. Only in the ‘Final’ does a touch of Romanticism appear briefly in the lingering echo of ‘Honoloulou’. Mandès, Golas, Gioèlés i Kroús.